Lately, Alia is on her promotional rounds for her upcoming movie Gully Boy and it seems she is bringing on the bling along with her co-star Ranveer Singh. From her heavily sequinned cropped-jacket by Fyodor Golan to her unforgettable Giuseppe Di Morabito's green sequinned skirt, the actress wants to shine bright like a diamond, literally. Styled by Ami Patel, in a Flor et.al metallic Ombré blouse and trousers, the actress looked super comfortable and effortlessly stylish. On the make-up front, Puneet B Saini, gave Alia her all time favourite no-makeup look which enhanced her already flawless skin even more. Priyanka Borkar, Alia's hairstylist, kept her hair simple and gave her a basic blow dry-look. 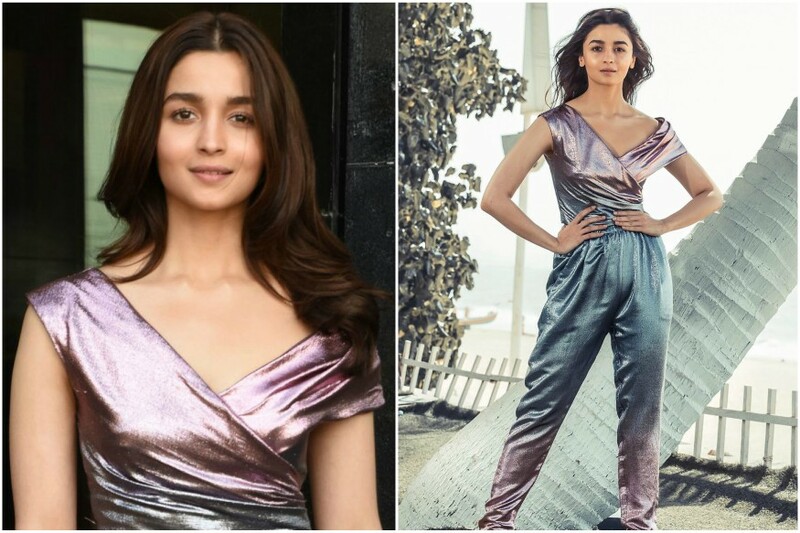 Often fond of rings and accessories, this time Alia ditched bling and let her metallic outfit do the talking.